On the most recent Wrestlenomics Premium Show Mookie and Brandon talk about Spotify being mentioned by the WWE at the BTIG conference. They glance over why WWE could have a useful relationship with Spotify. Mookie and Brandon joke about this being a possible relationship, but I think it could be very helpful for the WWE. 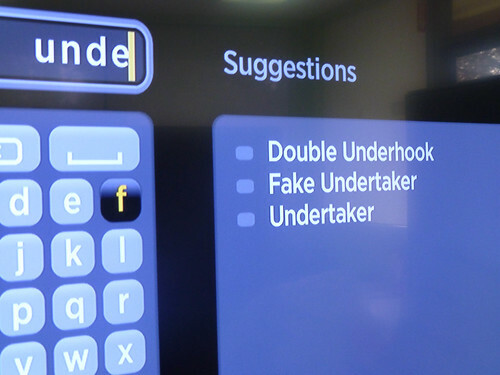 Suggestion Engine - Currently the WWE Network does not have a Suggestion Engine. Netflix, Amazon, and Hulu all have big suggestion engines, but I doubt any of these companies would partner with the WWE since they are all OTT video services. I think you would have an easier time partnering with an audio streaming services. Some people don't think suggestion engines are important. If a streaming service already gets your $9.99 a month, why do they want you to consume more content? It is because the more content a customer consumes, the less likely they are to churn out. Suggestion engines drive engagement without question. Bench Marking Suggestion Engine - An important part of a relationship between two companies like Spotify and WWE is common customers. Some users like suggestion engines and others just want specific contents. If you have a pool of common customers you can compare how your suggestions are acted upon on both platforms. You can adjust your suggestion engine to drive toward a number the other serivce is seeing. Marketing Leads - Mookie and Brandon made fun of marketing to Metallica fans. Seeing the listening habit of the common WWE and Spotify users is very useful when it comes to marketing the WWE. Spotify has features where you can follow other users, see shared playlists. Knowing the tastemakers on other OTT services would be useful when it comes to marketing leads.